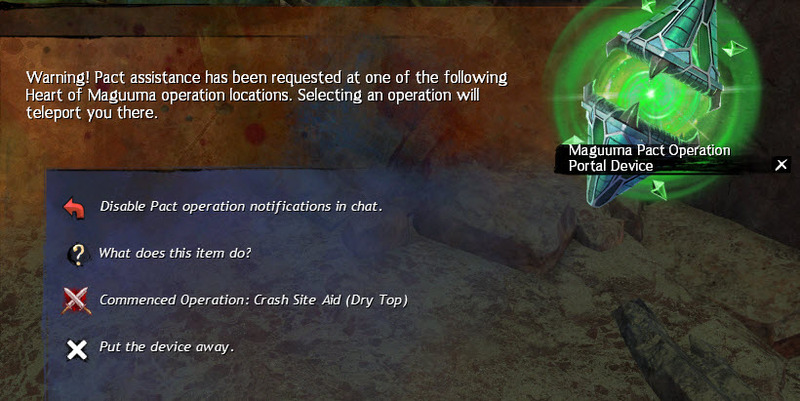 GW2 gemstore updated today with the Maguuma Pact Operation Portal Device for 400 gems. So the device would work for Dry Top, Silverwastes, and all the HoT zones? That’s it for today? Not even a brief teaser of next Ep 6 (map, new leg gs)? Disappointed….oh well hopefully next week is trailer week. I know that but we are already “a bit late” since the programmed date was last week, however I wasn’t asking for the patch itself for today nor full trailer, just a small teaser or even a single image of something new like they did for Skyscale. Imo, trailer might drop next week. The holidays are coming so that’s why they probably did not want to start anything now. Episode 6 will probably be out on 30th or may 7th. Well, they already released a video of Kralk and the article about the next mount 😛 I think that we already got something…and they will probably release more. Ok, well that portal would have been nice about 3 years ago. Not so much now seeing as no one I know still does those events at all regularly. I see HoT map tours (both meta and HP) literally every single day around EU peak time. Yes. HoT is actually more populated than PoF, from my experience. The irony is that due to the nature of the PoF maps and the fact that its metas are either not terribly rewarding (there is a distinct shortage of Amalgamated Gemstone sources in PoF) or too difficult for casual zergs to do (looking at you, Serpent’s Ire), people who are working on Gen2 Legendaries are instead doing the HoT metas and converting Crystalline Ingots to Funerary Essences for their Gifts. I’m good with GW2timer, looks like this is another way to sell people 1 more shared inventory slot. Don’t tell me about teleport, this teleport won’t bring you to your commander’s exactly map. With the remaining devs at Anet dumped into GW2 for the time being, they really need to make a better interface for these timers and the living world scrolls. They great convenience items but they so clunky to use that i preferred windowing out to the dulfy or wiki timers when i was still doing this content. Also while i dont begrudge GW2 for making this a direct purchase, i feel this item specifically would have been a good long rep grind instead of a direct purchase. If they introduced a new vendor that rotated between different areas (which dropped his currency when he was present) and let people purchase a single event timer from him on each appearance I feel lots of people would have had more motivation to stick around. I mean who here wouldn’t have spent 6 hours adventuring in the harathi hinterlands to unlock a SAB timer that did little more then list the month the event started in and its planned end date? Nah, A-net hase their own view on MMOs, they deni all the good features from other MMOs because this is “classic” MMO solutions A-net won’t be associated with. No classic quests, no reputation system, no housing, no companions, no bonus health in gear (unless you want to trade your DPS stats for it), no hotkey based interface (signle botton (H) for all character associated sheets, rly?) and other stuff we used to see in classic MMOs like WoW and WoW based analogs. So deal with it, A-net won’t be better or worse, they want to be different. But this is still best MMO for me by the sum of perameters, I just won’t buy the stuff like this ans spend my gems for extra bank tabs, character slots and some cosmetic stuff I really want and will use. But I really appreciate our whales who is buyin up almost every new skin just to use it for a 1-2 week untill they’ll buy a new ones and forget about previous for ever. These people keep the game afloat. Eh, too mutch words, just want to say, I have no problem with this item, of course A-net can do better, but we can change nothing, and this game still hase the best Cash-store among all the MMOs I know. You can REALLY play without microtransactions and still get all the loot you want. Every aspect of the game you state to dislike in your first paragraph I greatly enjoy. So each to tier own. As you said, this isn’t worth buying. I like the model of selling convenience items to bank roll the mmo but because this is such a weak convenience item (arguably worth less then the bag slot you put it in) it would have been a great freebee for a pseudo-rep grind – whhc would have checked off one of the things you miss from wow. WoW, huh? I though it was GuildWars1 for reputation grind to buy faction specific reagents and skills. A little late don’t you think? a few years late. Why not update the existing portal device with this, you greed.